There’s come a point now that we feel we’ve seen all that we think comic book movies have to offer us. After all, how many ‘saving the world/universe’ stories can we feasibly see in one lifetime? The Marvel line has, however, done extremely well to keep their characters and admittedly sometimes repetitive story tropes ticking over to the tune of critical praise and box office bank for years now. DC, too, are just starting to pick up the pace with this year’s Wonder Woman having been a pleasant surprise – this does, too, mean that Marvel has needed to outdo themselves yet again – and haven’t they just. 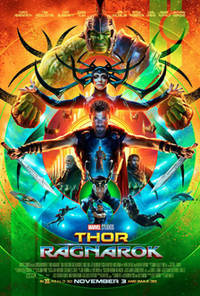 Thor 3 – in truncated form – picks up with lightning-summoning Asgard God Thor returning to his homeworld to find that all is not well – and, following a handful of surprising and tragic family events, the hammer-wielder finds himself fighting for his life in a bizarre realm beyond his reach. All the while, a long-lost family member seems hell bent on turning Asgard into her own brutal little playground – meaning that the Avenger needs to return home once again to overthrow the menace that has leapt out of seemingly nowhere. 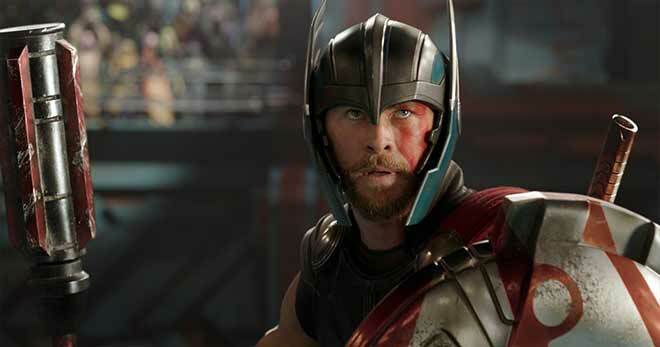 While Thor 3 is not a perfect movie by any stretch of the imagination, it is still arguably the most thoroughly entertaining and complete Marvel film to date. These are strong words – but the action, pacing, timing and character touches here and there are absolutely on point. The movie benefits from wry direction on behalf of Taika Waititi, who inserts himself into proceedings as an extra-terrestrial who steals more or less every scene he appears in. There’s returns from various characters – as well as an origin story for another – with a great soundtrack by Devo alumni Mark Mothersbaugh giving things a rather retro action movie vibe. It’s safe to say – it works! What’s so appealing about this instalment in Marvel’s line is the humour. This is easily the funniest the Avengers universe has been, with the lead character being immensely powerful and often unabashedly awkward in moments that are hard not to be entertained by. 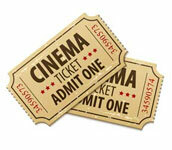 Comic timing and knowing humour help to propel the story along, which does – in places – go to unexpected regions. Nice cameos which we won’t spoil here don’t go amiss either, with one or two already hotly anticipated by Marvel buffs. Where the movie loses out on that crucial 0.5 stars is the storyline – while Cate Blanchett is a marvellously devilish villain with genuine menace, the main threat in this movie is all too predictable and it therefore loses a bit of its edge. There is plenty at stake – and we do genuinely care about the characters and the world of Asgard – but it’s easy to see where scenes are going to unfold to over the course of the run-time. At a cut of 130 minutes, it’s a movie which can feel utterly immense – but, to its credit, it never adds any fluff – and the climax contains a few nice surprises that are foreshadowed but genuinely satisfy. It’s a great-looking movie. Disney are making full use of Lucasfilm’s remaining Industrial Light and Magic studio create some genuinely stunning visual effects, character designs and set pieces. This is a movie that has tons of colour to it and it does have that Star Wars appeal in much of the action scenes – that being said, while the movie does take its time to take itself seriously, it never quite goes full mythology mode, unlike the Skywalker saga. It’s worth noting that the funny moments and the kooky touches here and there don’t necessarily spring up every five minutes. The direction here ensures that you get your fix of menace, action, intrigue and even pathos – when it needs to be serious, it does it very well indeed – and it is brilliantly funny when it is on form. As such, this may well be the first Marvel movie you could call a comedy alongside it fulfilling those all-important action movie standards. While last year’s Doctor Strange and Civil War were immensely entertaining in their own right thanks to character development, set pieces, stunts and more, Thor 3 takes matters to a new level altogether by being thoroughly watchable from start to finish. Where it goes misses out on that perfect score is when it does rely on the old comic book tropes to push forward. This, however, is to be expected to some extent – we’re not looking at Logan material here – and, when it comes to appealing to the core audience, everyone will be suitably satisfied and clamouring for the home release in the spring. An excellent surprise.